PRIVATE GROUP WITH AIR CONDITIONED MODERN MINIBUS O MINIVAN WITH DRIVER AND ENGLISH SPEAKING TOUR GUIDE DURING WHOLE DURATION OF THE TOUR.. Admission fees to sites or turist attractions are not included. PayPal is an internationally recognized payment website that uses SSL technology, so that your credit card number is securely encrypted. You can pay using any major credit card. 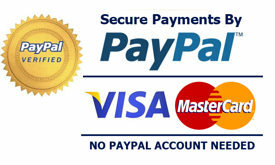 You do not need to have a PayPal account and you do not need to register with PayPal. You just pay like you normally would do online using a credit card. PayPal will automatically change language and convert currency during the payment process. Please do not pay until you have received a booking confirmation email from us. We will send you a Payment request to you.